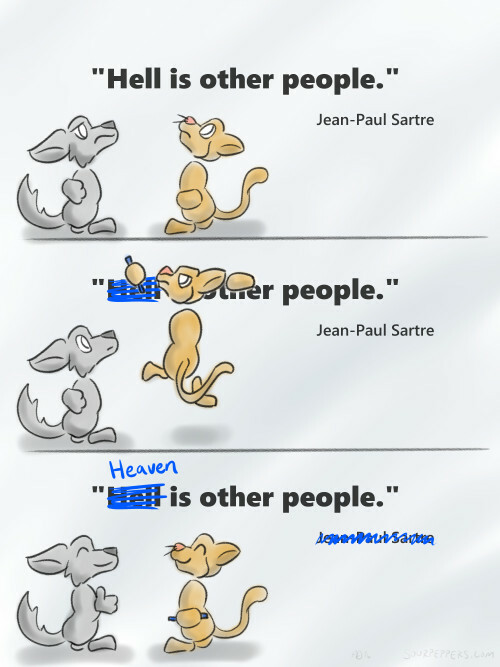 This quote by Jean-Paul Sartre has been examined by those much more versed in philosophy than I. That said, it seems to me that it could have a number of interpretations. Perhaps we sometimes view other people as nothing more than annoyances and inconveniences, constantly getting in the way of what we are trying to accomplish. Or maybe it's that other people cause us to constantly fret about what they think of us, for without the judging gaze of other people, we would never feel shame for our actions. Maybe there's some truth to these, but if so, I say we must also accept their opposites! Life's greatest joys cannot be experienced by ourselves. And it is often others who show us the good in ourselves that we cannot see. Without other people, there would be--could be--no heaven. Let us not become so self-absorbed that we see others people only as sources of pain and anxiety. Strive to see the good in each person and in our interactions with them.